Top sirloin steak is a great steak for grilling and in my experience, while not as tender as steaks from the short loin, such as the filet mignon, they have more flavor. So with the wife out and the kids in bed (early of course), it's a great time for the manliest meal, steak and potato(es). With a good steak like top sirloin, I like to keep it pretty simple. Just some minced garlic in melted butter and salt and pepper are enough for this tasty cut of beef. 1I look for a good fresh cut of top sirloin steak. Don't be afraid to talk to the butcher. Ask him if he can cut a fresh steak. Don't settle for one that is brown on parts of it due to air exposure and time. 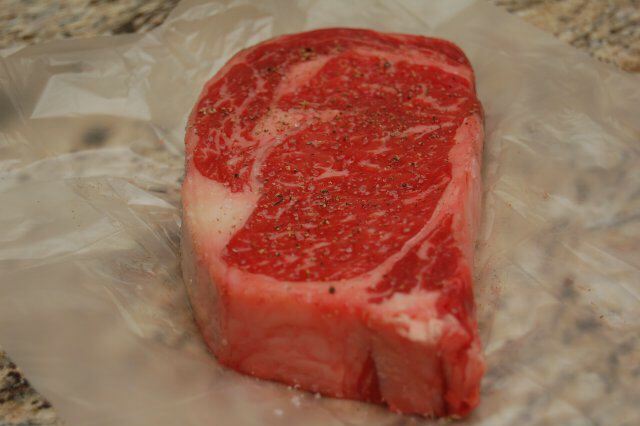 It should be bright red with good marbling throughout, that marbling is delicious fat. Trim back any excess fat as this will only lead to the dreaded flare ups. 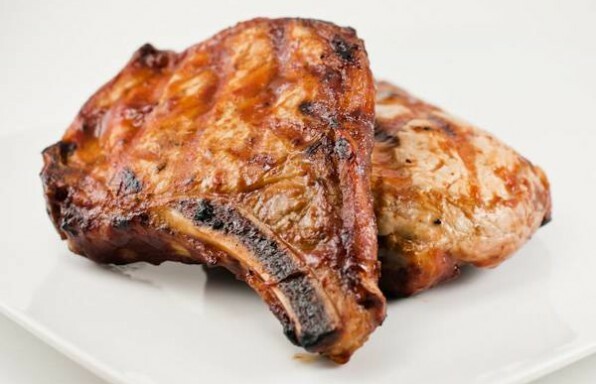 Take the meat out of the refrigerator 1/2 hour before to let it come up to room temperature. 1Prep the grill. Get it really hot with the lid closed for about 15 minutes. We are going to be cooking with the lid open, but we want the grill as hot as possible at first to get a great sear on that top sirloin. 2Pat dry then salt and pepper the steak. I melt the butter in the microwave. After the butter is melted, I add minced garlic (I actually use a garlic press) Brush the butter mixture onto one side of the steak. Make sure you get lots of garlic on there since the wife is out anyway. Lay the top sirloin steak onto the grill, butter side down. I recommend you lay it away from you and do it quickly since dripping butter on a hot grill may cause a big flare up. Brush some of the butter and garlic onto the top side of the steak. 3I can't tell you exactly how long to cook the steak for, because it depends. Depends how hot your grill gets, how thick the steak is, and how well you like it done, bone in or boneless. I look for browning on the edges. Since I like medium rare to medium, I wait until it starts to show brown 1/4 to 1/2 way up the side of the steak before flipping the steak. 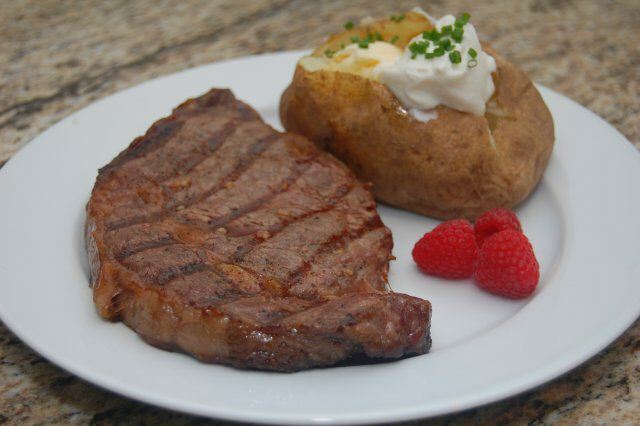 For medium rare on a 1 inch top sirloin boneless steak, total cooking time should be about 8 to 10 minutes. For a 2 inch boneless top sirloin total cooking time of about 18 minutes will give medium rare results. Ideally, you should be using a great instant-read meat thermometer. For medium-rare, cook the steak until the internal temperature is 135 degrees, then remove and allow the top sirloin steak to rest for 5 minutes. 4Use a good pair of tongs to flip the steak about half way through the cooking time. 5Once it is done, let it rest on the plate for 5 minutes before you cut into it. This lets the juices redistribute and keeps them from running out all over your plate. Serve up that perfectly grilled top sirloin steak and enjoy! Got some (weird) folks at the cookout that don't like red meat? Wander on over to our grilled chicken recipes and make them something they will actually eat. Good recipe, simple and deliscious. I am quite confident that the picture you are using is of a rib eye steak however. Thnx for the grilling tips. My top sirloins were the best I’ve ever BBQed! So many compliments after following this recipe. Glad I had an instant meat thermometer. I must admit, this was my best Top Sirlion Steak if ever made. I searched for a recipe since I usually find the Sirlion a bit tough. So glad I tried it. Great recipe! Simple and turned out great! I’m a 40 year vegetarian but my sigo is an all American carnivore. The steak dinner was my way (one of them) of thanking him for being helpful and sweet lately. Just thought I’d tell ya! Thank you! What Kyle said. Great steak! Wow! Wife likes garlic but not normally sirloin but this recipe was a hit for both of us! Tender, perfectly divine taste too! Thanks!!! I love your website. You have such a wit and wonderful grilling techniques. Every detail and tradition is quite fully explained, or should I say enlightens me. I haven’t had a dud grilled dinner yet since I’ve been on your site. Keep up the good work.